Well, if this works there will be champagne drunk in Cornwall tonight. In the far south-west the mobile web is an infrequent option! Anyway, grateful as I am for two bars of GPRS this morning what follows may or may not be the live stream of the launch of the new PUMA away kit for 2015-16 from Singapore at 1.30 pm. This is a growing post, snailnet permitting. Thanks PUMA for sharing the following brief video. Followed by this super snap. I must not be a marketing genius since I should have thought announcing the away kit could have been done live from Cornwall. Oh well. The away kit is not all that bad although it’s nice of them to have built dirt marks into the design. I’m not too sure about the away shirts. They look abit ‘pot-belly’ unfriendly! Although I like the gold tone though. Santi can sure juggle the ball..! Pangloss & Oskar from previous rounds: many thanks for your kind words. We took our three-and-a-half year old to his first kayaking trip (sharing our double kayak) and there were certain … consequences I was busy with. Nothing serious, everyone is fine but kept me away for the last couple of days. I think I successfully keep majority of my other interests and passions away from this board. I guess once in a while the Physicist or the literature-lover or the Jazz-fan comes out, but more or less I successfully stay away from bringing those up. My interest in Buddhism and Stoics runs deeper than intellect or passion, they have been surviving tools for me: being fortunate enough to have earned a good education doesn’t protect one from life’s vicissitudes. So I guess once in a while I somehow end up talking about those in places where I should know better. Everything around and in us are constantly changing, and I wouldn’t expect otherwise from a virtual community as well. Anyway, for Stateside Gooners: the Asia Tour is in NBC Sports Live Extra streaming, but unlike PL matches not in Comcast’s OnDemand listing. So use your laptop/tablet. Last year Emirates Cup was in ESPN go online, no announcement this year yet. 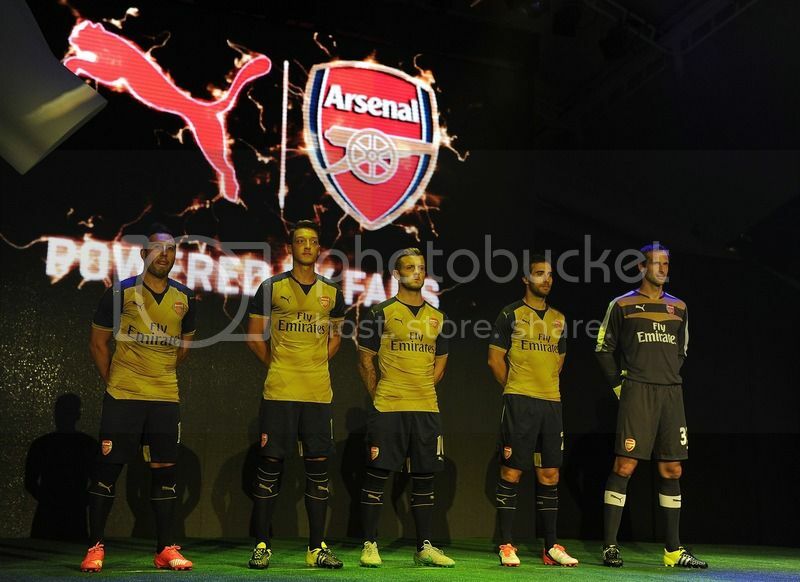 Another new kit…yawn, sorry I mean Wow! No I did mean Yawn after all. Whatever the consequences of your kayaking trip were, I hope you are all well and unharmed. Just to be clear, it is entirely up to you what you write about. This is not my blog and I do not decide it’s contents. You might be surprised to know that I have read books on Tibetan philosophies and were I to have to choose a religion, it would almost certainly be Buddhism. What irritates me in this bar at times is the refusal of some to simply disagree and let a matter rest. The endless repetition of a point does not make it any more or less valid, or make the reader any more or less inclined to agree with it. Continued repetition accompanied by philosophical and literary quotes, to my mind, tries to force the issue by in some way demonstrating the intellectual inferiority of the counter argument. Again, just my opinion, but it then becomes boring and inappropriate in what you also said is supposed to be an Arsenal discussion forum. There are clearly people who disagree and good luck to them. Disagreement is the lifeblood of a place like this – it would be nice to be allowed to do it less painfully at times. Still, I have got cheesed off with Oskar (no, really !) and King GT at times too – maybe I’m the problem. Drink is still on the bar for you. Cech will wear no 33, as he hinted with his vertebrae comment, so do nos 1, 13, and 26 all stay then? Dr F, hope all is well with the family post-trip. Water, kayaks and kids can make for a perilous combination. What Trev said @11. Guv’nor’s rules: Robust but civil conversation. Thanks Trev & NBN for kind words. Cannot wait for the Football…how nice to not have to worry about CL qualifiers. @ 11 IMO I think it’s best to just leave problems at the door of the bar and at least try to enjoy civil conversation with fellow Gooners. It’s going to be all action from start to finish this season! I do not intend to miss a second of it! a sober kayaker is a dry kayaker! The stakes and standards are high at present! I have to agree with what the Ox says based on the four or five games I saw Jenks play with West Ham last season. cba@19 – I’ve never been kayaking (although I tried white water rafting once) but from what I understand, a dry kayaker is a non-kayaker. iii) An explosive intestinal incident. I’m pleased to hear that said consequences have now abated. Drinks on the bar for all to celebrate my 60th birthday today. Happy birthday, Pangloss. 60 up calls for the champagne. A flute, coupe or simple white wine glass, as you prefer, of the house’s finest. Many happy ones Pangloss. I pray this gets through. Have a good one, my friend. Very many happy returns to you. You whipper- snappers make me envious. Sorry Uply, did not mean to repeat almost your exact comment! Shows that great minds think alike! It is great to see you back here again providing interesting commentary. I do hope your keeping well. I don’t disagree with you in relation to the need for supplementary support for Le Coq – its just that we now know how Wenger tends to view these things from his transfer policy in the past and how that’s changed so significantly in recent years. I think the mighty Arseblogger sums it up perfectly this morning when he refers to the signing of “Blue Chip” players. We will now only spend money on players that instantaneously improve the side. Cech is a blue chip player as is Alexis and Ozil. When these names are mentioned, any debate or consideration is almost immediately made redundant imo. You just automatically sign these if you get the opportunity to do so. I certainly could never say the same about Schneiderlinn for instance. And from what the trusted Phillippe Auclair has said, his representatives by all accounts wanted incredible wages. So I’m delighted that common sense seems to have prevailed in that matter – but I certainly would not be adverse to the replacement of Flamini, IF he decided to go, which I don’t think will be likely considering how he has managed to financially optimize his tenure with every single club he’s joined largely because he’s always moved on a Bosman, unless of course he gets paid to go. As for the stellar names you mentioned – I think Karim Benzema is a definite target. If either he or Reus became available – they too fall into that “Blue Chip” category from where I sit. I’m really relaxed about it all if I’m being honest. This is a really strong squad that can only be strengthened by the addition of top class players. A far cry from where we were a few years ago when we couldn’t hold onto the ones we had! So it’s all good and very interesting times to be a fan I feel. Delighted to see harmony restored. Both of you contribute so much to this place on a variety of different and interesting topics. Never pass up on an opportunity to have a pee. Never waste an erection, even if your on your own. Dr F@29: better check they didn’t switch the labels. Thank you for all the drinks, guys. Being called a whippersnapper is only one of the reasons I love this place. You’re not a problem, Trev (*11). You may be wrong on occasions, but that is your prerogative and I will defend to the end your right to be so. We all make mistakes. I myself used to be conceited, but now I can honestly say that I am perfect. And you are welcome to agree with me, or not if you must persist in being wrong. I hope you’ve noticed how many times I resisted mentioning my preference for a certain two players instead of the Coq while the DMF debate has droned on here. Such restraint! Yet it’s looking more and more like a distinct possibility. Competitive analysis is what makes this blog tick (one of the things anyway). That and the disparate nature of the members. Long may it continue.